Branded biker is a website focusing on all the major motorcycle products from the leading manufacturers, such as Arai, Halvarssons, Lindstrands, Jofama, Draggin Jeans,Autocom, Datatool, R&G, Artago, Belstaff, Givi and Scott oiler are to name just a few of over 100 brand names. Every one of the products, of which there are in excess of 5000, has its own image and information such as size charts, features and benefits which are all in an easy to understand format. Branded biker, part of J&B Motorcycles of Boston, have a long established reputation for supplying motorcycle clothing, helmets, parts and accessories since 1993.By working very closely with both the manufacturers and suppliers we endeavor to provide the best quality and value to all its customers. The Branded biker team, ranging from despatch riders to freelance journalist, are all passionate motorcyclists bringing a wealth of knowledge and experience. We can be contacted by telephone or by email to help with any technical or delivery inquiries . We are much more than just a website, we are also a fully equipped workshop and MOT center with a shop attached, where you can try hundreds of items on, get advice on the latest gear and even get your bike fixed and ready for action. When buying your Motorcycle helmet from branded biker we want you to be completely satisfied with your purchase. We have more than a decade of supplying and fitting Arai helmets and being a FIVE STAR/DNA Arai UK dealer we have a large selection of Arai helmets including the RX7 GP, QV, Quantum ST Pro, Viper, Astro, Chaser, Tour X, SZ open face helmets and an extensive range of accessories, spares and clearance items. Whether you choose an Arai, X lite, Nolan, Caberg, Givi or any of our Motorcycle helmets you can buy with confidence. With every current Motorcycle Helmet we include a unique branded biker helmet cleaning kit which includes; polish, cleaner, cleaning cloth, visor wipes in a handy pocket sized pouch. All our helmets are physically checked and packed for delivery where we track your parcel from despatch to its delivery destination. Our team of trained technicians are available to discuss any sizing, technical or delivery issues by telephone or by email by using the contact details on our home page. With over 25 years in the motorcycle industry brandedbiker have constantly strived to find the best, leading and innovative brands within the Motorcycle Industry. 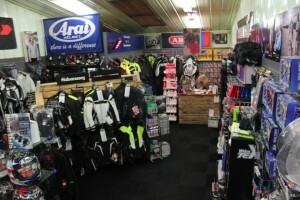 We are one of the major UK suppliers and stockist of Halvarssons, Lindstrands, Jofama and John Doe Motorcycle Clothing. Our portfolio of brands include; Weise, Draggin Jeans, Spidi, Halvarssons, Lindstrands, Jofama, Belstaff and EXO 2. We work closely with both the manufacturers and suppliers to provide the best quality, value, dependability and availability that you would expect from the market leading brands with a minimum of two years warranty . Our Motorcycle Clothing range includes; Motorcycle Leathers, Motorcycle Textiles, Motorcycle Jackets, Motorcycle Trousers, Motorcycle Jeans, Motorcycle rain wear, motorcycle back protectors and undergarments as well as an extensive range of Motorcycle clothing Care products. All our Motorcycle Clothing products are individually checked and packed for delivery prior to despatch where we track your parcel to its destination. For any technical, sizing or delivery issues please contact the branded biker team by telephone or via email by using the contact details on our home page. At Branded Biker we continually strive to find the best quality, styles and dependability from the leading manufacturers of Motorcycle boots. Within our portfolio we supply such leading manufacturers as XPD, Daytona, Forma and Lindstrands. We continue to be a major UK stockist of XPD Motorcycle boots directly sourced from Italy. Our extensive stock of Motorcycle boots include the XPD XP7-R, XPD XP5, VR5 and the x-zero boots in a variety of colour combinations. The Daytona Evo range are available in gore-Tex and non Gore-Tex, whilst the XCR has Gore-Tex as standard. We cater from 3 to 13 in UK sizes. whether you are looking for Motorcycle Race Boots, Motorcycle touring boots or waterproof motorcycle boots the branded biker team are available for any technical, sizing or delivery issues you may have, via email or by telephone using our contact details on our home page. Our impressive and constantly expanding range of motorcycle gloves include such market leading brands as Spidi, Halvarssons, Weise, Lindstrands and Jofama. We have in excess of 100 different styles and colours of Motorcycle Gloves in stock in sizes ranging from ladies extra small to mens XXXL. We continue to work closely with both our manufacturers and suppliers to provide the highest quality, style, dependability and value that you would expect from all our leading brands. Our extensive Motorcycle Glove range includes; Motorcycle Leather Gloves, Motorcycle Textile Gloves, Waterproof Motorcycle gloves, Outer Gloves and inner gloves. The branded biker team are available to discuss any sizing, technical, delivery or any other issues by telephone or via email by using the contact details on our homepage .